Tannadice Park often simply referred to as just Tannadice is a football stadium located in the Scottish City of Dundee. 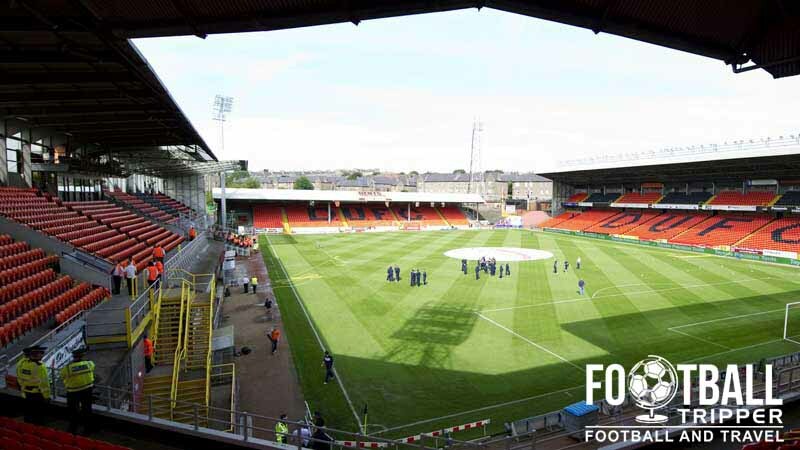 Home to one of two main football teams in the city, Dundee United F.C, the two rival clubs and stadiums are linked by a common road – Tannadice Street. The site on which Tannadice Park sits was first used for football in the 1870s when the Dundee city was yet to be fully urbanised with the ground then known as Cleptingon park surrounded by open countryside. Used originally by two football teams Dundee Our Boys and Dundee East End who would later merge to become Dundee United, the newly formed club first occupied the site in 1909 and have made Tannadice Stadium their home ever since. With local rivals Dundee F.C situated less than 200 yards up the road at Dens Park stadium competition for local supporters was fierce and United, then known as Hibs quickly opted to enclose the pitch with basic stands and facilities in order to begin the process of generating matchday revenue. Stadium developments throughout the 20th century were typically piecemeal with the most notable being the introduction of the new Main stand in 1962 – the first in the country to feature a cantilever roof with unrestricted views of the pitch. In the stadium’s centenary year, Dundee United surprisingly won the league title for the 1982-1983 season, a triumph which is yet to be repeated by the club with the club reinvesting revenues in under soil heating following the lead of Rangers, Hibernians and Queen’s Park. When the Taylor Report was published in January 1990 which declared that all stadiums should be seated the club were in a rather unfortunate position with only 2,252 seats in the stadium out of the then 22,310 capacity. 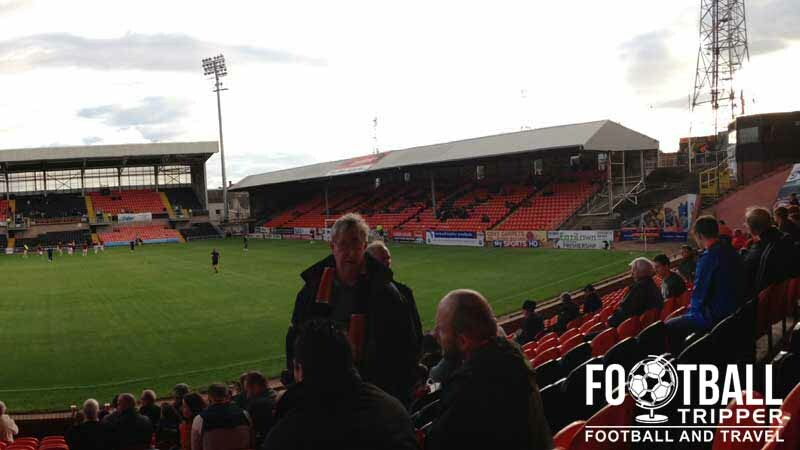 The club considered building and ground-sharing a new stadium with local rivals Dundee F.C but instead opted to redevelop Tannadice with the construction of three new stands: George Fox Stand 1992, East Stand 1994 and the Fair Play Stand 1997. After satisfying current ground regulations the stadium hasn’t undergone many major developments since with the addition of roof mounted flood lights in 2009 and plastic seats in the Jerry Kerr Stand in 2010 the only two examples of recent modernisation. Tannadice Park Stadium is comprised of four stands: North, East, South and West. 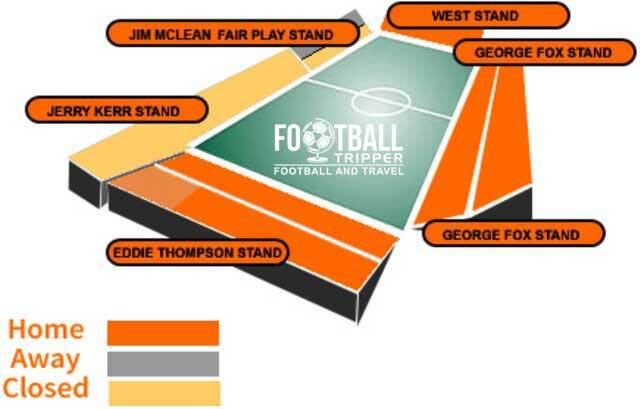 Away fans are housed within the Jim Mclean Fair Play Stand which sits to the left of Jerry Kerr Stand closest to the West Stand, and is capable of accommodating around 1,000 supporters. Combined both of these stands run for the length of the pitch to the south. If you walk to the ground and proceed along Hilltown Road which later becomes Mains Road you will encounter half a dozen watering holes on-route such as The Barrels, The Maltman and Bowbridge Bar. This road will then take you past Dens Road Stadium and onro Sandeman Street where The Tangerine’s ground is located. There are too many fast-food options to mention within the city centre, but rest assured that all the familiar franchises are there. Similar to the pub situation there are quite a few independent eateries along the preferred walking path to the stadium such as the popular Cinnamon Indian a Restaurant, a few chippies and a Greggs which is a slightly anomaly. Dundee United run a club store at Tannadice Park in addition to their very own online store, the very stylish The Tangerine Clubshop. Both have an excellent range of official merchandise, and combined should more than have you covered. Matchday: 9.00 am until kick-off and for a minimum of 30 minutes after the full time whistle. For more information, to query an order or to confirm opening times please send an email to [email protected] or phone 01382 889926. Dundee United Fans celebrating a joyous moment on the pitch. 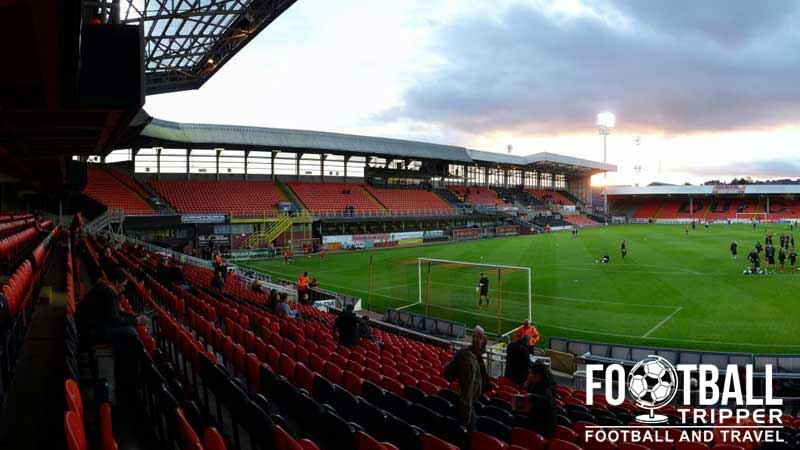 Dundee United don’t currently offer fans and the general public the chance to undertake a stadium tour of Tannadice Park, however if this ever changes we’ll be sure to amend this section. 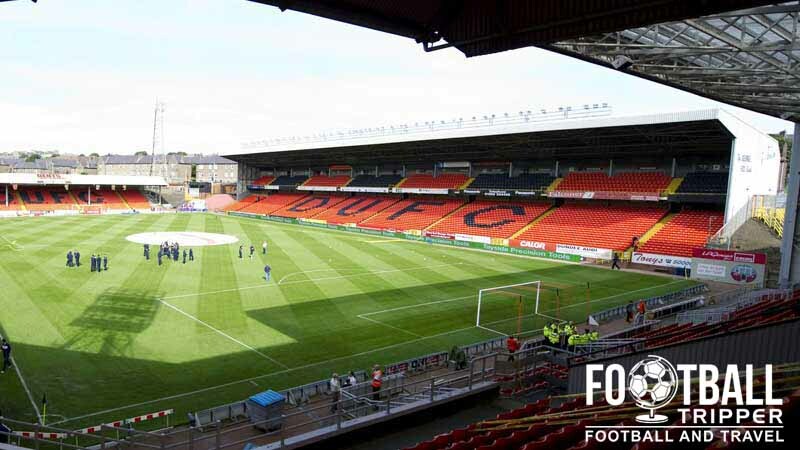 Tickets to see Dundee United play football at Tannadice Park can be purchased via the usual channels including online, by phone (01382 833166 and selecting options 1 or 3), or by visiting the club’s box office in person during the week leading up to the match. Refers to the George Fox Stand and Eddie Thompson Upper. Applies to the Eddie Thompson Lower and Jerry Kerr Stands. Tannadice Park is located around 1.8 miles from the centre of Dundee and the bordering River Tay. Situated within a stones-throw from Dundee FC’s Den’s Park, the two rival grounds are connected by Sandeman Street. Outside Dundee United’s Tannadice Park Stadium. On-street parking is available in limited amounts within the immediate environs of the stadium, but please be respectful of any residents and make sure you double-check any signs regarding parking. You can always ditch your car in one of the city centres many car parks, and make the 30 minute journey by foot. Dundee Train Station is located approximately 1.6 miles south of Tannadice street where the ground is, with the resulting distance likely to take the average fan no more than 30 minutes by foot without pub-crawling. As one of Scotland’s busiest stations there are frequent services to Glasgow (Queen Street), Edinburgh and Aberdeen, as well as direct connections to English cities such as Newcastle, York and London via King’s Cross. From the city centre fans can use the 1A National Express Bus service to travel to the stadium. For fans travelling from Glasgow you can either catch a bus service from Buchanan Station within the city centre. For further information and to find complete timetables please visit the City Link website. The closest hotel to Tannadice Park is the cheap and cheerful Travelodge located on Strathmore Avenue, however if you’re planning on making a weekend of it then you might as well walk five minutes further into the centre of Dundee. Here there is everything from a Premier Inn, Travelodge, Holiday Inn and even an affordable Hostel for backpackers.